The Histogram Plot ( ) plots 1-dimensional histograms and some variants on the idea of a 1-dimensional Kernel Density Estimate. In many respects it works like the Plane Plot, but it has a restricted set of plot types and an additional fixed control Bins, and the scrolling works a bit differently. See the Window Overview for features common to all plotting windows. 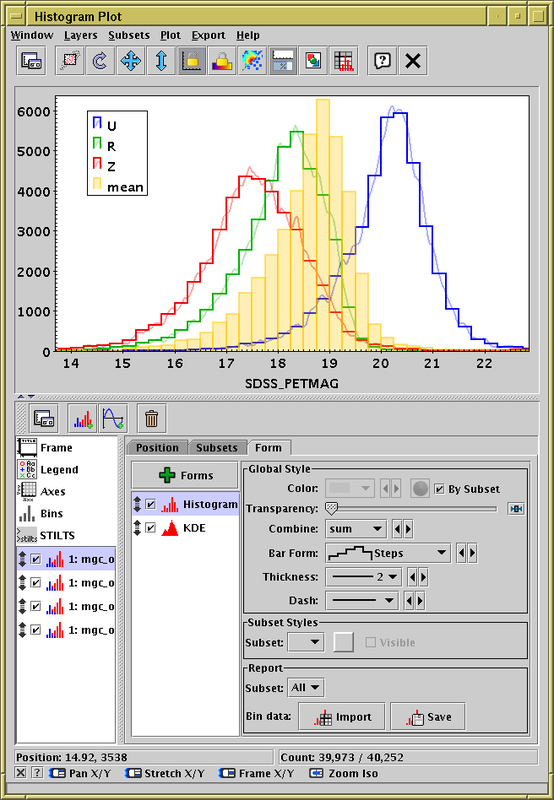 Adjusts the vertical range of the visible data region to accommodate all the histogram bars in the currently visible horizontal region of the plot. The horizontal range is not changed. The bin counts/sums corresponding to the currently plotted histogram will be written to disk in tabular form. The first two columns give the lower and upper bounds of each bin, and the subsequent columns give the occupancies of each bin for each plotted data set. If only one dataset is plotted, there will only be three columns. Assembles a table as per the Save option above, but rather than writing it to disk imports it directly into TOPCAT, where it can be manipulated in all the usual ways. The following subsections describe navigation, axis configuration and bin configuration.